Dentures are recommended to those with missing teeth and the tissues that connect to the teeth. These are removable replacements and are made of acrylic plastic, porcelain or metal materials. Dentures look like the natural teeth and gum tissue. Partial dentures (also called partials) are needed when not all of a person’s teeth are missing. They are used to fill in the spaces of missing teeth to prevent the existing teeth from shifting position. Partials are made up of teeth attached to a gum or pink-colored plastic base. It is sometimes attached to a metal frame or clasps to keep it in place inside the mouth. 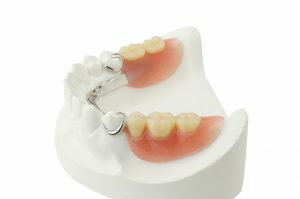 Others may have a precision partial denture which is a more natural-looking appliance with internal attachments. Create missing teeth model. These can be in wax forms or plastic patterns to get the precise shape and position of the dentures. The model will be fitted several times. The color, shape, and fit of the denture will be checked before the final denture is molded. The final partial denture is cast and you will be asked to try it on to see if it fits you well. Adjustments will be made if needed. Partial dentures may feel a little strange for a few weeks. You will need allow time for the muscles of your cheeks and tongue to get used to the new teeth. Learning how to insert and remove them comfortably will also take some practice. Minor irritation or tenderness may occur and saliva flow may increase during the first week or two. There is nothing to worry as these symptoms will diminish as your mouth adjusts to the partial dentures.